Introduction: The Legacy Pages give access to parts of the original SRCMBC and SRCMYC web sites which are not yet available in the new web site format. Eventually most, but not all, of the pages will be reformatted for the new (2016) SRCMYC/SRCMBC web site. Please accept our apologies if viewing the old pages causes problems! Web Site History: The Scale Section web site was first set up in 2008 with the address “srcmbc.org.uk” since “Solent Radio Control Model Boat Club” had become used to denote the scale section of the Club. 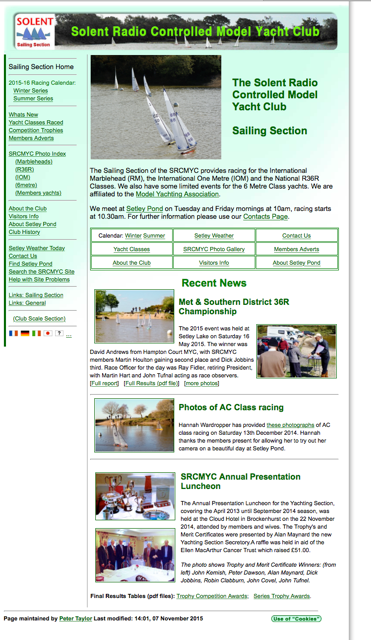 A Sailing Section site was created in 2009 with the address “srcmyc.org.uk”. Many pages on the two sites showed the same content but with different headers and navigation menus. Back in 2008/2009 web sites had much less prominence than today. Many Club members had no access to the web. Those who did have access would be using a desktop computer most often connected to the web using a telephone modem and “dial up”. The original web sites were designed knowing that they would always be viewed on a computer screen. Adding contributions to the sites needed the ability to write “html” and “php” code and to transfer files by “ftp”. The 2016 SRCMYC/SRCMBC site: The new site is designed to be viewed on mobile phones and tablets (like the iPad) as well as by computer. It is powered by “WordPress”, a management system which allows Club members to contribute their own items to the Club’s web site without having to write computer code. During the 8 years that the original site existed a lot of content was added including sections “About Setley Pond”, the “History of the Club”, and “Hints and Tips”. These sections will be made available as “Legacy Pages” until they can be integrated onto the new web site. The links below will take you to our old Club Web Site. 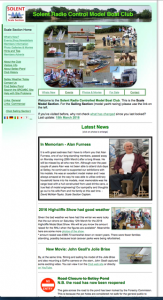 When viewing the old site, links on the left hand menus will allow you to return to this page, here on our new Web Site.